GQUEEN focus on a wide variety of functional glasses from anti blue ray radiation computer glasses to UV400 protection polarized sunglasses and other fashion eyeglasses. We endeavor to provide quality products at prices which provide value to our customers. Polarized sunglasses have a filter that works to prevent the glare from reflecting on flat surfaces (water, snow, road pavement) which interfere with vision. They can be highly useful for sports, driving, and fishing by helping the participant in these activities to see more clearly. Advantages of wearing polarized sunglasses became recognized by the general public. they provide premium protection against the sun's harmful rays. UV400 protection lenses block 100% of UVB and UVA rays. UV 400 indicates an eye protection item that has been optimized to prevent eye exposure to both UVA and UVB radiation. UV 400 protected items are capable of blocking light rays as small as 400 nanometers. Glasses X1, Package box X1, Microfiber cleaning cloth X1,Microfiber pouch X1. All GQUEEN Sunglasses comes with a 30 Day Money Back Guarantee.So if you are not completely happy with your purchase for whatever reason,do not hesitate to let us know and we'll take care of you.You have no risk to try it and we will provide you the best service! ANTIOXIDANT METAL FRAME WITH POLARIZED LENS-effectively reduce glare reflected off of roads, bodies of water, snow, and other horizontal surfaces. Restore true color, eliminate reflected light and scattered light and protect eyes perfectly. Polarized sunglasses cut glare and haze so your eyes are more comfortable and you can see better. 100% UV400 PROTECTION- block 100% of both UVA and UVB rays. UV400 rated sunglasses are essential to protect your eyes against long term UV damage and keep your eyes healthy when you go on outdoor activites. EXQUISITE BRAND DESIGN-newest brand design combines historical elements with anachronistic technological features.Hydrophobic and anti-scratch, resistant and durable,circle fashion style. ROCKING STEAMPUNK SUNGLASSES WHEREVER YOU GO- houseboat ,driving, running, fishing,racing, skiing and climbing, trekking and business or other outdoor activities enthusiasts. LIFETIME BREAKAGE WARRANTY & 30 DAY MONEY BACK GUARANTEE- in case of any problem, contact with GQUEEN without hesitation to solve the problem until satisfaction. 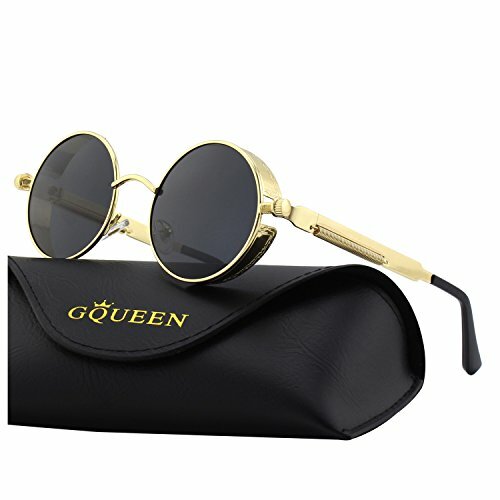 GQUEEN provides lifetime after sale service for all GQUEEN sunglasses in case the purchasingtisfactory. You have NO RISK to try. If you have any questions about this product by GQUEEN, contact us by completing and submitting the form below. If you are looking for a specif part number, please include it with your message.